...But you don't want that to happen to your strongholds in the War between Heaven and hell. In the Liber Castellorum (Book of Tethers) discover how Tethers - the celestial outposts on Earth - form, grow and die. Learn how to protect your Tethers from attack, and how to undermine the fortresses of your enemies. From the halls of Notre Dame to the House of the Morning Star, Tethers are everywhere. 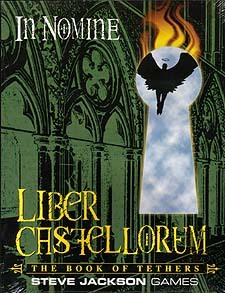 The Liber Castellorum contains Tethers for all the major Superiors, worldwide, including examples that can fit into any campaign. It also includes guidelines for creating Tethers, staffing them, protecting them, handling them in play... and destroying them. If your celestials dream of becoming Seneschals, or just need to work off some dissonance, the Liber Castellorum will provide inspiration, plots and settings.